In order to get off the hatchery treadmill, I need at least three good-sized flocks. I figure 12 hens and a rooster in each flock. Although I might get by with eight hens, you invariably lose some before or after they are fully mature, so I’m hedging my bets. Remember, I’m trying to supply birds for the table as well as enough eggs for seven people year round. Next year’s eggs and fried chicken. 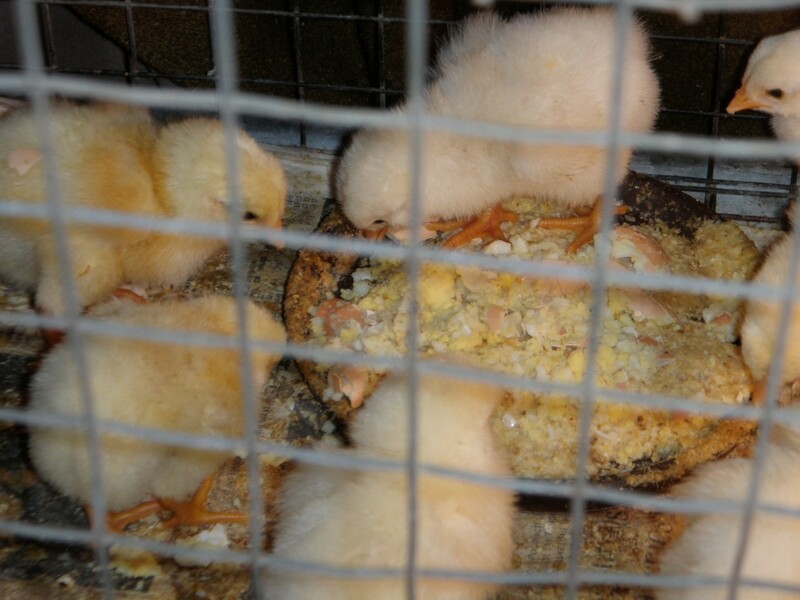 Most hatcheries require that you order a minimum of 25 chicks so they will stay warm in shipping. The first year, I’m obviously going to have extra birds, which allows me to select the best birds for breeding and put the rest in the freezer. In Year Three, I will save pullets from the chicks I hatch, and ditto the year after. At that point, I will start butchering some of the original hens. That means I need good-sized pens, as I may have as many as 36 hens in a flock for a few months. Ideally, I like to have about 10 square feet per bird figuring the total space in the coop and run — so 360 square feet per flock. It may get a little crowded while the younger birds are growing for butchering, but it’s doable. Although chicken wire is much less expensive, with our bear problems, I’m going to use heavy-duty wire fencing panels for the coop. The ones I already have are five feet tall and 16 feet long, with 2×4-inch openings. The openings are too big to be chick-proof, so we’ll need to put chicken wire around the bottom to keep the babies in. If we put the pens side-by-side, the panels in the middle can do double duty, which means I need only need seven panels. However, I have the current flock to consider, and this year’s chicks will be laying for another two years at least. I suspect I’m going to wind up building a fourth pen, which means I need to buy two more panels. A 16-foot square pen is 256-square feet. A 12×12 coop would be ideal in terms of size, but in our county you can only build a 100-foot square structure without a permit. Since 12 feet of wall plus a four-foot gate would eliminate the need to buy any more panels, it looks as though we’ll be best off with an 8×12 coop. 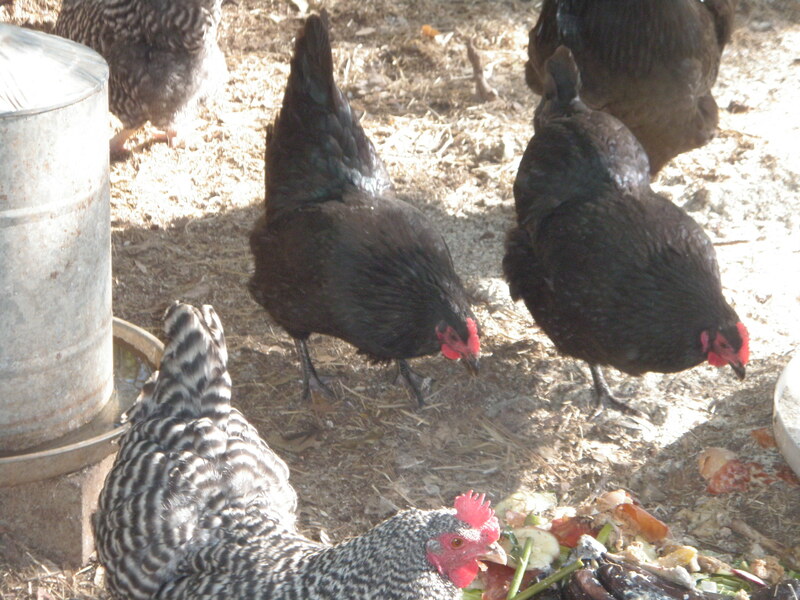 In addition to egg-laying space and nighttime roosts, I want at least three broody pens inside the coop. The broody pens will keep the hens and chicks secure and safe from predators (like the bear that destroyed my chicken tractor and slaughtered four hens and a rooster). A nest box should be at least 12x12x12, and they can be stacked one on top of the other. The experts will tell you that you need one nest box for every two to four hens. I find you can get by with half that, unless your hens will also be setting in the nest boxes. Hens tend to all lay in the same box for some reason; it’s as if the presence of someone else’s egg makes them think this must be the most desirable box. You can try encouraging them to use all the boxes by keeping a false egg in each box. If you have the space and the funds, you can add additional nest boxes, and if you find your hens are breaking eggs because they’re squabbling over space, by all means add more. Rather than let them set in the nest boxes, I prefer to use broody boxes. Broody boxes should be a little bigger – at least 14x14x14 – and should be at floor level, so the chicks can get in and out. A broody box should also have a small enclosed pen to allow mama and the babies to move around for the first couple of weeks or so without interference from other chickens. Isolating the broody hen in this manner has a number of benefits. The setting hen is safe from other hens or the rooster. Since she’s in an enclosed area (obviously you’ll need to give her feed and water) the risk that she will get off the eggs and wander around to plop herself on the wrong nest is zero. If you want to raise chicks from a particular hen, just shut her in the broody box and collect only her eggs for a week or so. Put them under her or another broody hen, or use the incubator. 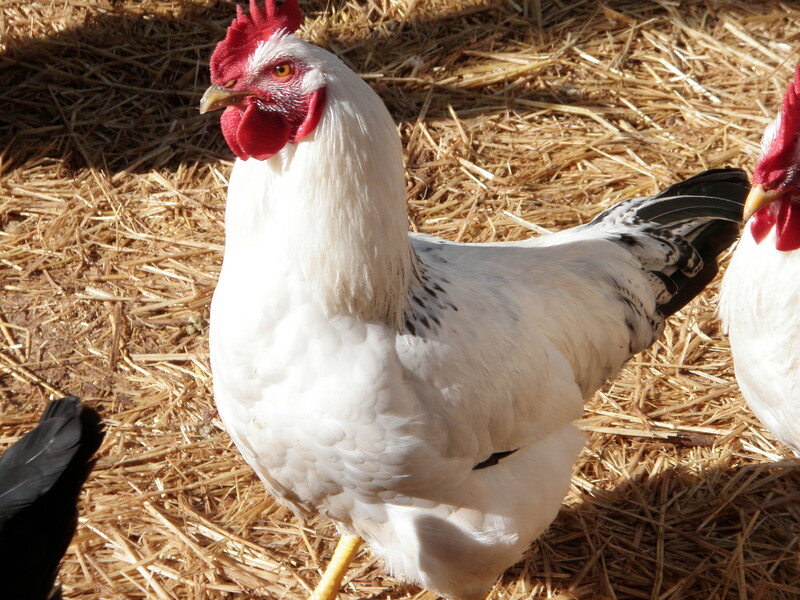 Standard-sized chickens need at least 12 inches of roosting space per bird. In the winter, they’ll pack more closely for warmth. Some chickens may prefer to sleep on the floor; it’s a contra-survival measure, as those chickens would be fox food in the wild. We humans have bred them for so long, however, that a few birds may no longer have the survival instinct. 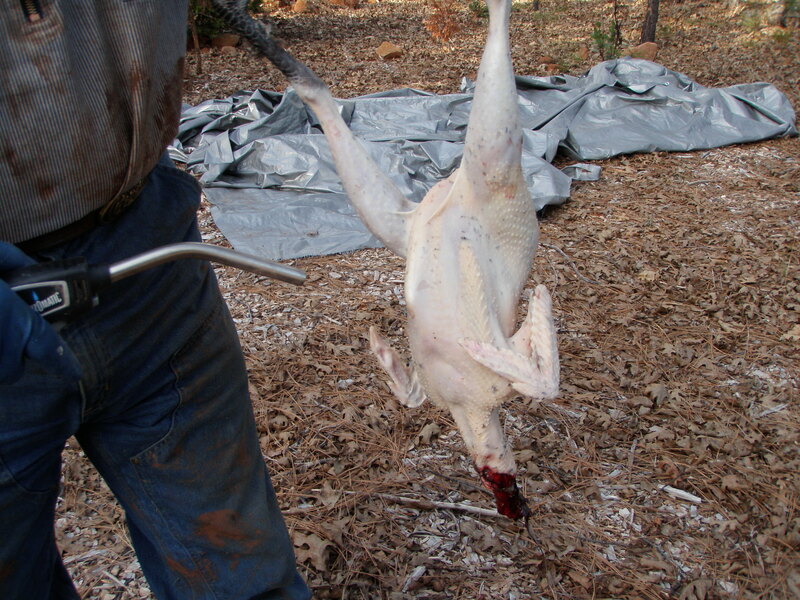 The roost poles should be about two inches in diameter and sturdy enough to support 70-80 pounds of chickens per pole. The diagram at the top of the post shows the way I want the new chicken coops to look (it’s not exactly to scale). 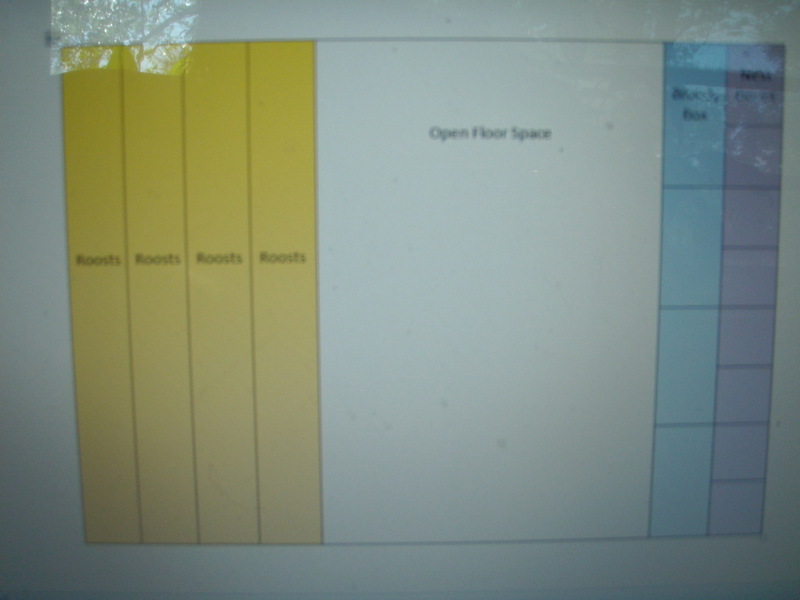 The small square purple boxes on the right are the 8 nest boxes. They’ll have a slanted roof on top so the hens won’t try to roost there. The four rectangular blue boxes are broody boxes, also with slanted tops. Each box is two feet square. The vertical yellow rectangles on the left are the nighttime roost area. The roost is conveniently located next to an outside door so we can clean it. It’s also a good idea to build a pit under the roost, as it will help keep droppings confined and keep the hens from getting underneath it to lay their eggs. Put chicken wire or some other sort of metal mesh across the top of the pit to keep chickens from getting between the roosts and into the pit. You build the roosting bars so they can be lifted up out of the way for easy cleaning. If you put the roosting bars on a slant, stair-step fashion, it gives the hens a little more room. Each coop will have one people-sized door to the outside and one chicken-sized door leading into the run that can be shut. Raccoons, ringtail cats and feral domestic cats can climb fences, so we want to be able to keep the chickens secure at night. These coops are big enough that if it’s raining really hard, the chickens can come inside out of the weather and still have a reasonable amount of room for a few hours. They’re too small for lots of chickens indefinitely. This entry was posted in Farms, Food, Uncategorized and tagged broody box, chickens, chicks, coops, eggs, hen, nest boxes, roost, rooster. Bookmark the permalink.